Your style is of course an evolution and will change over time depending on various factors relating to your lifestyle. However, being clear on who you want to present to the world is something that is unlikely to be drastically different no matter what stage of life you’re in. Now that you’ve discovered your colours and understand and love your body shape the final step before building your wardrobe is to find your personal style. There are 7 universally common style personalities with easily identifiable names, all you need to do is discover which ones you relate to most. Again, remember we are all unique and much like with body shapes it’s likely you won’t fit exactly into one of the style personalities. They are guidelines to help you figure out your style personality by taking inspiration from and combining the traits that resonate with you. First have a think about how you would describe your style and what is important to you when it comes to getting dressed. Consider a few key descriptive words and a summary of how you want to present yourself to the world, drawing on your personality traits and goals for inspiration. Note these down in your Stylebook before starting with the quiz. There is also space to record your quiz answers in your Stylebook. A - I like to be casual and down to earth, I love comfort and easy to care for clothes. B - I am organised and practical and prefer to fill my wardrobe with versatile investment pieces. C - I am spirited and self expressed and originality is key. D - I am bold and like to stand out in a crowd and wear striking clothes that make a statement. E - I am sensitive, gentle and supportive and love feminine details such as lace, gathers and frills. F - I am magnetic and like attention and I use clothing to highlight my amazing body. G - I am cultured and poised and compliment my lifestyle with polished, fashion forward clothing. Add up your letter scores and refer to the style descriptions below where you scored highest. These will give you a starting point to better understand your personal style. Combine the aspects that resonate with you most to form your individual personal style description. Feeling comfortable in your clothes is most important to you and your easygoing nature tends towards more casual outfits. Simple lines and designs are your preferred choices over anything too detailed or fussy. In keeping with this carefree attitude you tend to buy only easy, wash and wear garments. You prefer fabrics such as denim, cotton jersey and lightweight knits. Your jewellery choices reflect your minimal look and you tend to wear basic and durable accessories with footwear also focussed on comfort. You are drawn to refined clothing and understated accessories, preferring to invest in quality fabrics and timeless styles rather than jumping on trends. You have a rather formal wardrobe and always look polished and put together. Matching and co-ordinated looks are your preference over those that incorporate bold colours and prints. Your jewellery and accessory choices are not overbearing and are complimentary to your outfits without being the focal point. You’re way of dressing is innovative and individualistic and you aren’t overly influenced by current trends or traditional rules. You use your clothing choices to reflect your personality, and put together unique and interesting outfits with items purchased from varied sources. Different colours, textures and prints fill your wardrobe and your jewellery collection is bold while your footwear and accessories are usually statement making. Wearing the latest fashion takes precedence over comfort and you are willing to give most new trends a go. This means your wardrobe consists of many different styles and one off pieces ready to make a statement. Your look is striking and well thought out with added details providing the finishing touch to your look whether it be a bold lip colour or eye catching shoe. You compliment your statement making looks with jewellery and accessories in shiny metal finishes or bold one of a kind wearable art pieces. You have a soft appearance and generally prefer flowing silhouettes and muted colours. Your clothing choices are pretty and you love feminine details such as bows, ruffles, pleats and lace. Even with simpler styles you will most likely choose them in pretty colours or with decorative details and you can never go past a floral print. Your footwear and accessory choices are delicate and minimal with fine necklaces and ballet flats among your staples. 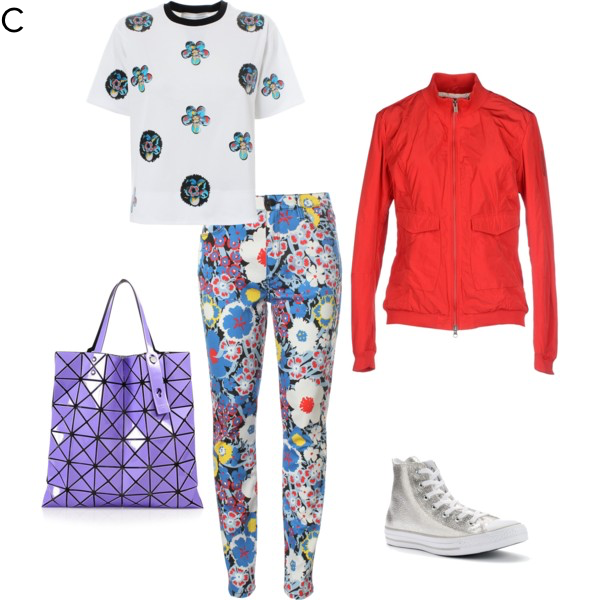 You like to make an entrance and favour bold colours and prints to ensure you stand out from the crowd. You are usually showing off your body in figure hugging silhouettes and know how to work a plunging neckline and short hems. You prefer to wear heels whenever you can and make the most of accessorising as another way to add intrigue and flirtation to your look. You likely put a lot of time and effort into personal grooming, always providing your friends with the latest beauty tips. You put time and effort into the way you look and you love accessories, sometimes spending more on bags and shoes than anything else in your wardrobe. You’ve likely experimented with most key styles and while you definitely follow trends you generally shop with care and won’t buy into a trend that doesn’t compliment your existing wardrobe. You tend to avoid bright colours and go for a tone on tone look. Your jewellery choices reflect this minimal approach, either making a statement with a single accessory or balancing a number of more subtle pieces. If you're feeling creative and want to visualise your individual style then Pinterest is a great web based tool to get you inspired and facilitate a virtual scrapbook. Otherwise you could take a more hands on approach, cut out of magazines and print images that embody your style to create a real life scrapbook, collage or pin board. Display it in your bedroom or on the back of your wardrobe door so you're always stepping out with your style personality goals front of mind. Have fun with your style and enjoy creating you!